Want To add value and style to your kitchen? Consider granite countertops. Classic Carpet & Flooring and St. Louis’s largest wholesale fabricator, Hallmark Stone team up to offer superior design, fabrication and installation of granite and quartz countertops. In addition, we are certified fabricators and installers of engineered materials including Silestone® Quartz Surfaces, CaesarStone®, Hanstone™ and Eco Recycled Glass Countertops by Cosentino. From simple cuts and edging, to custom mitering, our full-service shop can accommodate projects of any size and complexity. Classic Carpet & Flooring, and its team of qualified professionals have been providing top-quality granite fabrication and installation services since 1991. Our first-quality materials add long-lasting value and beauty to any business or home environment. One of the hardest and strongest materials in nature, granite originated from the earth’s core as liquid magma. Granite is forged by extreme heat and pressure, making it the 2nd hardest substance on Earth (next to diamonds). Granite’s innate ability to withstand constant abuse will impress you. A granite counter top is nearly impossible to scratch (you can even cut your veggies on it, if you don’t mind dulling your knives), hot pots won’t hurt it, bacteria and stains are not a problem under normal use and proper cleaning. Most granite is naturally porous to a certain degree and thus susceptible to staining, however, we offer the patented Sensa sealing process allowing most species of granite to be sealed at the fabricator, eliminating the need to seal your countertops. Browse a selection of available granite slabs. Silestone is a compound made up of 94% natural quartz, which makes it extraordinarily hard and resilient. This is the one and only countertop made of quartz with antimicrobial protection, giving it hygienic properties that are not to be found anywhere else on the market. 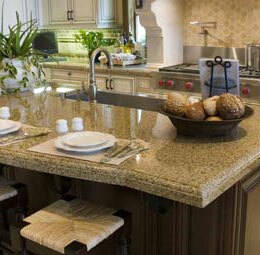 Offered in a wide variety of patterns and colors, quartz is an excellent surface for kitchen countertops.